See a color chart of dyed rabbit skins. The dyed rabbit skins use our Better Grade Rabbit Skins from Spain. 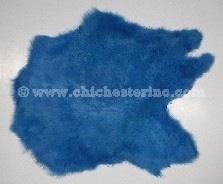 These skins have excellent fur quality and are soft and supple. These rabbit skins are chrome tanned. 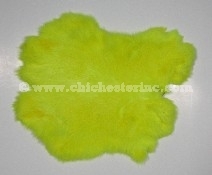 We offer a variety of colors of better grade dyed rabbit skins. With the exception of the black-dyed skins (which have been dyed in Spain), all of the skins have been dyed professionally in the United States using using high quality professional dyes. The dyed skins are about the same size as the better grade skins. Some will be a bit smaller because the skins tend to shrink somewhat when dyed. We start out with good quality and end up with a superior product. You will be impressed with the quality of the dye job, especially with the fluorescent skins--a difficult job to get right at the best of times. The fluorescent colors are glow in the dark under UV/black light. These skins will not lose their color if they get wet. The Black Dyed rabbit skins are a mix of the better grade rabbit skins that have been dyed jet black in Spain. We usually keep between one and two thousand of these rabbits on hand in our Niagara Falls warehouse. We can order any quantity you desire. The black-dyed skins are about the same size as the better grade skins above. Some will be a bit smaller because the skins tend to shrink somewhat when dyed. Although, you also get some that are bigger. In general, other firms sell lower-grade, smaller black dyed skins. We start out with good quality and end up with a superior product. For more information on our rabbit skins, please click HERE for the main rabbit section. For Larger Dyed Breeder Rabbits, click HERE. Sometimes we receive some rabbit skins that are not consistently dyed. We sort these skins out and sell them as discounted closeouts. 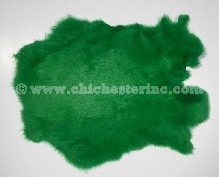 Please see our Odds & Ends Furs page for discounted dyed rabbit skins. Product of Spain, Dyed in the U.S.A. Weight: One hundred better grade rabbit skins equals approximately 12 to 14 pounds; one rabbit skin weighs approximately 2.1 oz.